Former Coronation Street star Thelma Barlow is to star as a baddie in the next series of Doctor Who. Barlow, 77, who played timid Mavis Wilton in the ITV soap for 26 years, will star as Lady Thaw in an episode to be shown next year. 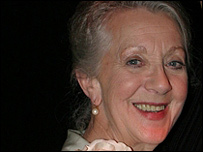 The actress is also known for her role in BBC sitcom Dinnerladies. The episode will also feature the League of Gentleman's Mark Gatiss, 39, as a scientist. Gatiss wrote two earlier episodes of Doctor Who. A third series of Russell T Davies' Doctor Who is due to air in spring 2007, following a Christmas special this year. It will see actress Freema Agyeman, 27, taking over from Billie Piper as the Doctor's assistant. The BBC recently announced a Doctor Who spin-off starring Elisabeth Sladen, who played one of the doctor's companions, Sarah Jane, in the 1970s. That series will kick off with a one-hour special early next year.